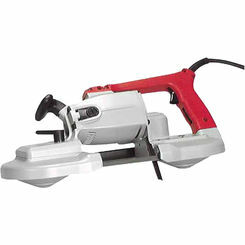 Great for making wood projects go more speedily, band saws are a must have for serious carpenters. 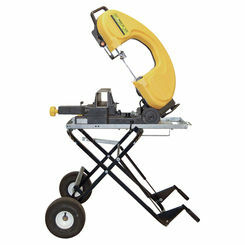 As one of the most useful power saws, the portable band saw offers unique functionality in that it consists of a steel-bladed band that is rotated endlessly on two wheels. 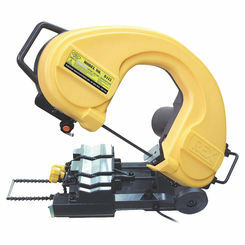 The bandsaw can be used to cut a number of materials. 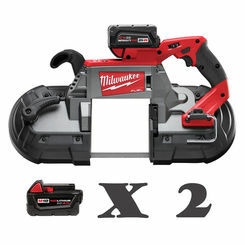 At PlumbersStock we carry only the best in power tools which is why we offer discount Milwaukee options. 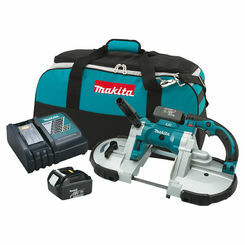 When you need a brand new portable bandsaw, or just replacement bandsaw parts, we are certain to have the best deal online for you. If you’ve ever seen a woodworker cut multiple boards at once, chances are he was probably using a bandsaw. 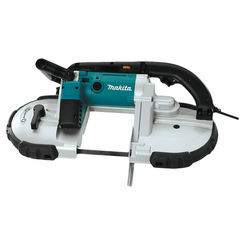 It is a unique, specialty power saw, great for cutting boards. 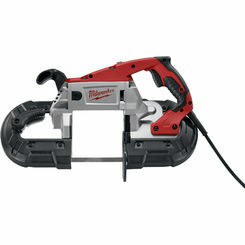 It combines a sharp-toothed blade with a high-speed continuous loop. 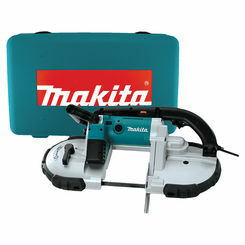 Bandsaws are best used for cutting several wooden boards at a time or for cutting through irregularly curved boards. 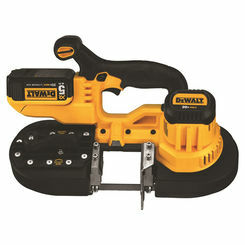 You will be surprised at how much your portable bandsaw cuts. 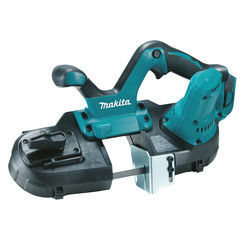 Typically they also come with the ability to make precision miter and angle cuts. 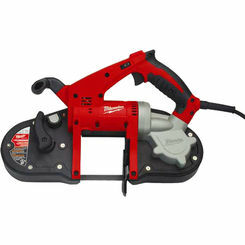 Bandsaws come with several different blade options available, specifications ranging from the type of metal, width, thickness, length, and the tooth form (standard, skip, or hook-teeth) of the blade. Changing any one of these factors can greatly affect the outcome of the cut, so keep that in mind when you’re shopping for new blades. Generally speaking, the more TPI (teeth per inch) a blade has, the tighter the cuts and better it is at making elaborate details. On the flip side, the less TPI a blade has, the better it is at making straight cuts and cuts through thick stacks of wood. The most common blade (and the blade that your portable bandsaw will come with) is a ¼ inch, 6 TPI skip-tooth blade that’s ideal for curved and straight cuts. Another common type of blade is the ¼ inch, 14 TPI standard-tooth blade that’s perfect for those finishing touches, crosscutting, and joinery. Finally, the ½ inch, 3 TPI hook-tooth blade is useful for making those thick stock and straight cuts. 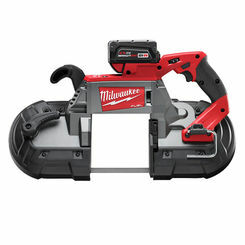 Although a portable bandsaw may look scary, if you know how to use it properly, you can safely and efficiently cut through materials like wood or plexiglass. 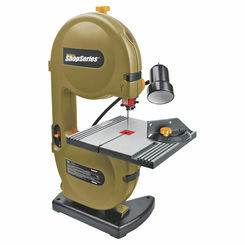 Here are some tips to prolong the life of your bandsaw and stay safe while working with it. Wear Eye Protection – First and foremost, when working with any sort of power tool, hand tool, or operating equipment, it’s important to wear safety glasses. Bandsaw blades spin at incredibly high speeds and small pieces of material that get stuck within the teeth can easily be tossed out in any direction. Protect your eyesight by always wearing eye protection. 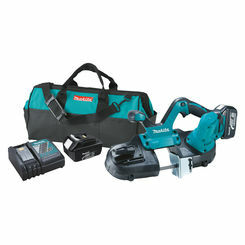 Check the Band Saw before Each Use – Your band saw requires a lot of components to work together keep the blade working properly. These wheels need to be inspected regularly for signs of degrading wear and adjusted according to the manufacturer instructions. 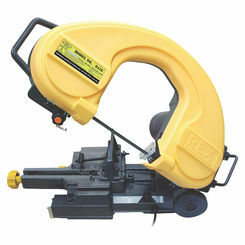 Ignoring inspection could result in heavy damage to the band saw when in use and could cause the blade to break prematurely. 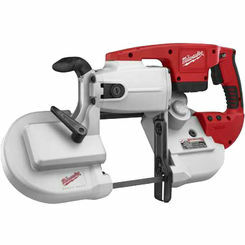 Plan Ahead – While you probably know you should wait until the motor is running at full speed before starting any cut, cutting curves is probably the trickiest part. 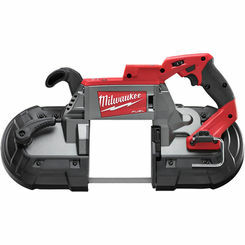 If you know you’ll be cutting curves, use a band saw rip fence or miter gauge to help you with the cut, as this will increase the accuracy for a specific width or angle cut. Additionally, it’s a good idea to draw an outline of what you want the curve to look like before you actually do it. Keep Hands and Fingers Away – It seems like a common sense rule, but if you’re going to be cutting something, always keep your limbs away from the blade. 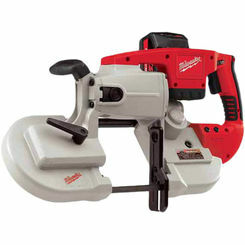 A good rule of thumb to follow here is to always keep hands at least 3 inches away from the blade. If you need to hold you piece closer than 3 inches, do so with the help of a push stick or shoe. 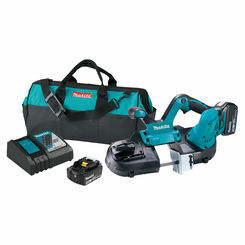 With our online hardware store, you can save big on power saws, like the new cordless bandsaws you see right here. Call for prices that are not listed. They are so low that we are contractually prohibited from advertising them.